Wow, this week has been a hectic week. 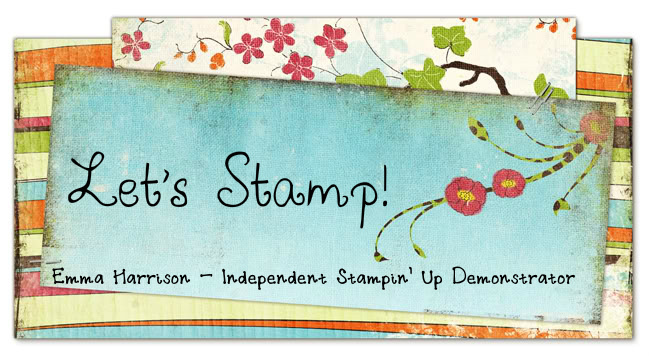 In between sewing labels onto school clothes, hunting for school PE kits that have mysteriously hidden themselves over the summer holidays, I've also had the joy of the new Stampin' Up! Idea book & Catalogue arriving plus new stamps and on top of all that it's the last chance list! Phew, I think I need another holiday! I just had to share this card with you. Becuase I Care is my favourite out of all the 2010-2011 Hostess sets and will be going at the end of the month. I just love that large Hydrangea flower and it's such a lovely set to use for so many occassions. I inked up the hydrangea using Pretty in Pink and Rose Red markers with Old Olive for the leaves. I then misted the stamp lightly and stamped it onto our watercolour paper to create a lovely soft image. The papers are from the Subtles Collection and it's finished off with some gorgeous seam binding ribbon in Rose Red. Don't you just love how easy it is to match colours across so many different products? Anyway, this card was for one of my hostesses. I hope she liked it.